How Do You Leverage The Power in Life’s Small Moments? Our life is comprised of discrete moments. We get up, and that’s a moment. We come in the door and greet our spouse…moment. We tell our kids to get off us…moment. Our lives are measured in moments, and defining moments are the ones that endure in our memories. How are we executing those moments? Are they done with intention? Are we using them to their potential? 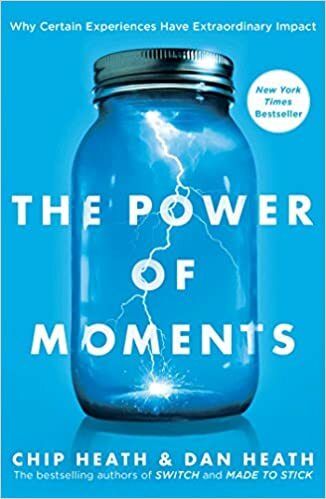 There are two goals in The Power of Moments by Chip and Dan Heath. First, they want to show us what the defining traits of moments are. Second, they want to equip us with the tools that we need to create defining moments in our lives and the lives of those that we interact with. A short experience that is both memorable and meaningful. So a defining moment can be anything. Any event that is memorable and meaningful. It could be that time your parent took you to the aquarium 25 years ago because you once talked about thinking jellyfish were interesting. According to Chip and Dan, there are four elements of defining moments. Defining moments don’t need to have all of these elements or even two of the elements. A defining moment simply needs a single element to be a defining moment for the one experiencing it. They use these four elements as the backbone of their book, walking us through each area to give us deeper insight into what it means and how to bring them into our lives. There are at least two other interesting thoughts they get into before the main content of the book. I bring them up here as well because you’ll continue to see them throughout the book’s content. First is the peak-end rule. There is a unique study of colonoscopies where they made the procedure longer by a minute, but that last minute was merely mildly uncomfortable compared to the rest of the procedure. Patients that had longer discomfort but the end wasn’t as painful, rated the procedure as less uncomfortable. They rated the overall procedure more favourably because the end wasn’t quite as bad. Even though overall the patients had more discomfort due to the procedure being longer. You see this again in their note on service encounters. A study of service encounters asked customers to recall recent satisfying and dissatisfying interactions with employees of airlines, hotels, or restaurants. Almost 25% of the positive encounters cited by customers were actually employees responding to service failures: slow service, mistaken orders, lost reservations, delayed flights, and so on. When employees handled these situations well, they transformed a negative moment to a positive one. I’ve seen this in the handling of some of my outdoor gear. When a product broke down well before it should have and was handled well, I’ve continued to purchase from the company with confidence that they’ll deal with any issues that arise. For freelancer’s, this is important to remember. When a project is going off the rails, how you handle the issues, and how you deal with the ending will predict fairly well the customer’s opinion of you. If you end a poor project well, you’re much more likely to get repeat business and referrals. Now, let’s look at the four elements of defining moments. Moments of elevation are the “peak” moments. The medals we earn, but not participation ribbons because we know deep down that everyone gets them. It’s winning the school election that is a peak moment. This is what competition is for kids, something we continually strip away from them. A peak moment is the first time you let your kid plan a family outing, and it goes well. They have peak event that they can think back on with a sense of accomplishment. We can handle these in two ways. We can play defense, noticing the moments as they happen. We do this at home as we “tell” on each other for being awesome. While this is a great place to start, but we need to play offense as well. Playing offense means, that we look for ways to bring elevation experiences to those we can influence. In our house it is the first overnight backpacking trip where you carry your gear on your back. It marks a growing up stage and something where you get to pick a hiking stick to go with the rest of the family sticks on display at the house. Moments of elevation are even preferable to filling in all the bumps in the experiences of those around you. Sure fill in the huge holes, but the bumps can happen. You’re much better off moving someone from a 7 out of 10 rating to an 8 than moving a 2 to a 4. Customers going from 7 to 8 to 9 are far more valuable than improvements at the other end of the scale. There are three keys to building moments of elevation according to Chip and Dan. To have a proper moment of elevation, we need at least two of these elements. Breaking the script happens when a customer has a problem, and they leave the encounter with support shaking their head and grinning. It’s the child’s stuffed animal that is left at the hotel and then is mailed home complete with extra “vacation” photos of the bonus vacation the stuffed animal had. Sensory appeal is about making the event big and inviting. One story provided in the book is the appeal of showing up to announce which college you’ll be attending to your whole school. It’s a big event like graduation where hundreds of people show up for the announcements. Raising the stakes is making it big and matter. The Heath’s tell the story of a mock trial in front of the principle and some local lawyers and the captain of the football team. People that have significance in the kid’s lives. The stakes of not performing well mean something to them. Note that the thing that kills these moments is reasonableness. Ignore the soul-sucking force of “reasonableness.” Otherwise you risk deflating your peaks. Speed bumps are reasonable. Mount Everest is not reasonable. It’s a lot of work to rent that hall for the announcement of which college you’ll go to. It’s a bunch of work to bus kids to the courtroom. It’s a huge amount of work for us to take three kids out on a backpacking trip and encourage them the whole way to keep going so they can earn their hiking stick. Reasonable is how we get employee of the month, which in the eyes of employees rotates between people so that we all have a turn. Reasonableness is loyalty cards with prescribed levels. It’s easy for a company to do, but is hardly a moment of elevation in the life your customer. So if you want to break the script and shy away from reasonableness, then you need to look at the next moment because it applies in many ways to your managers that need help in taking the risk to break the script. One of the great stories for moments of insight, provided in The Power of Moments, is the story of taking a team of software executives and asking them to use the product they sell and manage just like a customer would. After a whole day, many of the teams of executives had nothing to show for their effort. You can’t appreciate the solution until you appreciate the problem. They had the insight that their product was harder to use than they expected and embarked on making fundamental changes many of them had been resistant to just days before. There is nothing like being the CEO/manager and also a client. We also see moments of insight as we look at mentors. Those relationships of people we trust that are a few steps ahead of us. Those people that encourage us and can call us on our crap so that we can affect change. Mentors call us to a higher standard with their wise criticism. This is important to note because you need to be looking for mentors and you need to take the responsibility of being a mentor seriously. As a mentor you have a huge responsibility to those you mentor. You can bring about huge amounts of change if you take the responsibility seriously. Mentors can be especially impactful when they help build the pride of the people they call to action. Pride isn’t just working hard. It’s not just winning. It’s courage, which can only come in the face of risk and fear. And moments of pride capture us at our best — showing courage, earning recognition, conquering challenges. It’s having your skill noticed by others. If you’re in a mentorship role, remember this. A single word from a mentor recognizing a skill can send someone sky high in pursuit of mastery. It’s getting promoted. Winning an award. Having your hard work recognized. Having the skills your best at used and desired in your field. Of all the ways we can create moments of pride for others, the simplest is to offer them recognition. This also goes back to playing defense with the moments. This is seeing that your worst salesman is actually best at smoothing the feathers of annoyed customers and praising that ability. They would never win the highest sales prize, but noting in a meeting that they are the go-to people for tough clients, will be a huge step in building them up. Moments of connection deepen our relationships with others. Some of the fastest friends I’ve ever made that continue to stick are those friends I made climbing and kayaking. Most specifically whitewater kayaking. See, on most basic climbs, nothing happens. You climb up and get lowered down. Even on the simplest whitewater runs, things happen. A beginner flips over and needs a rescue. An advanced person has some random mishap and needs a rescue. They need to suddenly rely on others to get them out of the water safely and quickly before the mishap turns into something more serious. These are moments of connection. Teams of us, at times, worked to rescue a stuck boat, or pull someone off a random rock in the middle of a river. We connect through these experiences. We need these close connections to make it through the tough times in our lives. In groups we make these connections by having a shared purpose. In the last section, we saw that moments of pride come when you distinguish yourself as an individual. As a result of achievements or courageous actions, you are made to feel special. But for groups, defining moments arise when we create shared meaning — highlighting the mission that binds us together and supersedes our differences. We are made to feel united. For kayaking rescues, the shared meaning was getting everyone home alive and unhurt. I’ve seen this over and over as we have guided camping trips. Teens that spent two weeks together and dealt with rain, wind, hard days and rescues. These teens talk 20 years later and trace their friendship back to working together during through that challenging trip. Building these moments is something that remote teams need to look at closely. Remote work is amazing for day to day interactions. For getting the regular tasks done, but it’s terrible for building full team cohesiveness. Remote contact is perfectly suitable for day-to-day communication and collaboration. But a big moment needs to be shared in person. (No one dials in to a wedding or graduation, after all.) The presence of others turns abstract ideas into social reality. To help create these connections teams need to meet regularly. More than yearly, preferably quarterly. More than just planning, they need to have other shared experiences together that will build shared purpose. Finally, connection comes from responsiveness. That’s the little moments around us. When we come home, does our spouse acknowledge us? Do they more “grunt” at us, or turn to engage us? Our relationships are stronger when we percieve that our partners are responsive to us. While there are some very outdated ideas in See You At The Top by Zig Ziglar, one great one is that we should be focusing on how we put effort into our relationships with our spouse. Now, Ziglar, says that my wife should have the children neatly dressed. Dinner should be on the table, and she should be freshly showered and have makeup on to greet me at the door. Clearly a bit dated. But should she put some effort into how she greets me when I come home? Yes. Should I put effort into how I come in the house and the first actions I take to make sure that I show her she’s the most valuable relationship I have? Yes. What does nonresponsiveness look like? You walk in the door distraught, and your partner doesn’t even notice (anti-understanding). When you describe a new interest or passion, your partner seems uninterested or dismissive (anti-validation). In a situation where a hug or soothing comment would go a long way, you get a blank face (anti-caring). Nonresponsiveness is corrosive. It deprives us of our individuality; we’re not seen or treated as special. Being responsive means showing interest when the people around us are excited about a new hobby. We don’t dismiss it as another fad; we take time to share what they’re interested in. We do this because non-responsiveness is poison to a relationship. While this wasn’t as quotable as many books I’ve read, the ideas churning in my head are huge. My wife is a figure skating coach, and we brainstormed for an hour on how to build moments into the kid’s skating progress to help keep them around and interested. I worked with a client to build more moments into the customer journey to help make their business stand out. I’ve got two copies on the way to give to younger people who are just entering into their lives as mentors as they take on new leadership roles. Cynthia and I are working on some moments we can use in homeschool and in general with our kids to build their pride and confidence. So, yes purchase and read the book. Then, act on the ideas in it so that you can build more powerful experiences for those around you.